This manuscript contains Dam Phi mantras. These mantras are recited to make offerings to different Gods, the ancestors and the dead. 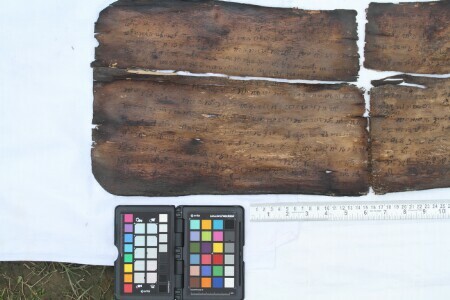 This manuscript may be of the type known as Khek Lai. The first page, top left, contains the text chau nv ru chau kau vi, khun thau nyav lang ku ri mo phi khv me phi nyav … 'Oh Lord above our heads, oh my Lord. The great and elder prince Langkuri …' This is a manuscript of the prayer used until today in ceremonies like Me Dam Me Phi and No Khowa. The first section is a prayer to Langkuri, then Jan Sai Hung, then Lareng, then Lengdon then Ja Sing Pha. The prayer is in three sections, the first au tang, the second is kin tang and the last is poi tang. In the manuscript only the first two are present. This manuscript is about the different Gods and Godesses like Lengdon, Langkuri, Jasingpha and others. This is a Dam Phi puthi which is about the spirit after the death of a person. It contains a Dam Phi mantra. It is written that after 10 days of the death of a person he becomes a Dam, after 20 days he becomes the household diety.